If you don't need to leave your house today, don't. 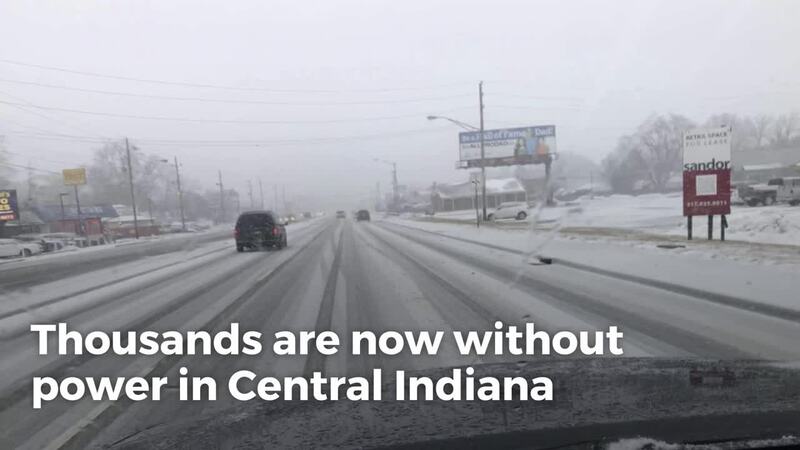 INDIANAPOLIS — Parts of Central Indiana are under a winter storm warning as inches of snow are in the forecast for the area. This blog will be updated throughout the day with information as it comes into the RTV6 newsroom. Indianapolis Metropolitan Police Department Officers have responded to 76 property damage crashes, 15 person injury and 5 no information crashes. An orange level Travel Watch has been issued for unincorporated roads in Madison County, effective Saturday evening until further notice. A Travel Watch means that conditions are threatening to the safety of the public. During a “watch” local travel advisory, only essential travel, such as to and from work or in emergency situations, is recommended, and emergency action plans should be implemented by businesses, schools, government agencies, and other organizations. Unincorporated roads are those roads maintained by Madison County, usually roads outside cities and towns. Strong winds will cause additional traffic hazards. Use extra caution when traveling and if possible stay off the roads so street crews can clear snow from the pavement. Businesses, Churches and other organizations should implement emergency action plans while the county is under a Travel Watch. Roads are snow covered, and the wind is making it difficult for crews to keep roads cleared. Please stay off the roads unless travel is necessary. If you must go out please allow yourself extra time and slow down. Currently, Delaware County is under a travel advisory. RTV6's meteorologist Todd Klassen sent in this picture from 46th and Emerson. Firefighters in Carmel are on-scene of a tree that fell on a house. Check out some of the pictures sent in to the RTV6 newsroom here! If you have a picture you would like to share with us, email it to news@wrtv.com. A Travel Watch is issued for Hamilton County, effective Saturday, January 19, 2019, at 5:30 p.m. EST until further notice for the unincorporated roads maintained by Hamilton County. The National Weather Service in Indianapolis issued a winter storm warning through Sunday Morning. Heavy snow and brutal winds will lead to near blizzard conditions. A Travel Watch is an intermediate level of a state-wide travel advisory system and means that conditions are threating to the safety of the public. Only essential travel is recommended due to the severity of the winter storm warning. Emergency action plans should be implemented by businesses, schools, government agencies, and other organizations. Routine travel or activities may be restricted in areas because of a hazardous situation. As a reminder with winter driving, reduce speeds, leave extra room between vehicles, make sure all windows are clear of snow and ice, turn on lights to increase visibility even during the day, allow extra time to reach a destination, and make sure to keep an emergency kit along with a fully charged cell phone handy. In case of a slide-off or crash, contact Hamilton County Public Safety Communications at 317-773-1282 or 9-1-1 for an emergency. According to Indianapolis Power & Lights website, about 500 customers are without power. You can view their outage map here. INDOT trucks are loaded up with salt and headed back out. ROADS UPDATE: Snow is falling lighter w/ smaller flakes. Exterior roads are melting well, but #Noblesville Street Dept is dealing with drifting on rural/open roads. Main roads are still the focus at this time. Remember, don't crowd the plows. Miami County is now under an travel watch. Several other counties north of Indiana are also under a travel watch. Thousands are without power east of Muncie, according to the Indiana Michigan Power outage map. At this time, it is unknown when the power will be restored. Reports of near white out conditions because of blowing snow that is already on the ground. Boone County is now under a travel advisory. BCSO Traffic Alert: Boone County is currently under a travel advisory authority EMA. The National Weather Service is advising people if they don't need to leave today, don't. Several counties in Central Indiana have issued a travel advisory including Hamilton, Madison, Hancock, Tippecanoe, Howard, and Delaware County. You can view the latest advisories and watches here. The rain and freezing rain this morning into early afternoon has cut down on snowfall potential for Indianapolis and areas west. Snowfall of 1" -3" from Indy west. 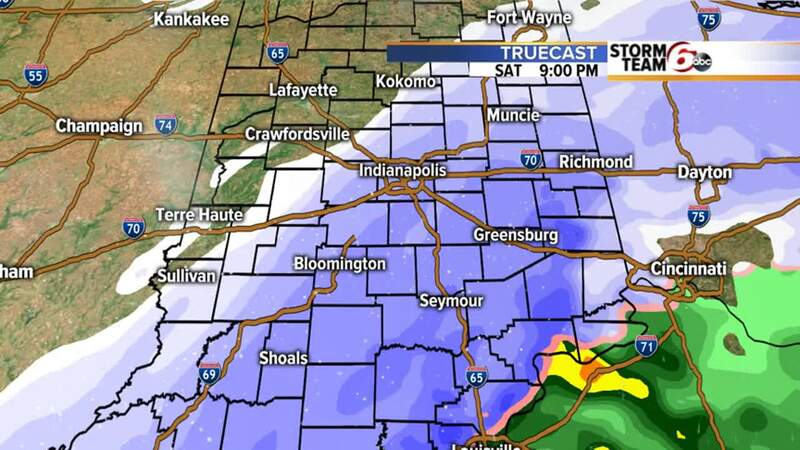 More snowfall is expected east and south of Indianapolis. Colder air will change any wintry mix to all snow as we go through the afternoon into Saturday evening. Temps will continue to slide until dropping into the single digits Sunday morning. Windy gusts over 30 mph are expected. Wet untreated roadways will become icy as the water on the roadways freezes. Muncie Police Department Officer Chase Winkle says the roads are getting icy in Muncie. Use caution today if you are heading out the door. It looks like it's getting icy out there Muncie! I come on at 6pm. If traffic lights are out at an intersection, treat it like four-way stop. Authoriites in Tipton County are warning residents of the risks that snow, wind, and ice have on things like power lines. Indianapolis Department of Public Works said in a tweet salt truck will go back out on the roads once the rain stops. Have a photo that you would like to share with RTV6 to use on-air and online? Send it to us at news@wrtv.com! With a winter storm quickly approaching, power outages, snow, ice, and freezing temperatures are potential risks. Click here for tips from the Department of Homeland Security on how to stay safe. The trend throughout the day will be for any rain to change to snow as the cold air comes rushing in this afternoon. The bulk of the accumulating snow for southern and eastern locations will be this afternoon and evening. Snow should end to the northwest by late afternoon. To the south and east the snow will linger until closer to midnight before tapering off. Mostly areas will be in the 3”-6” range, but to the southeast and east some totals will likely approach the 8” marks. Some areas to the west might not make the 3” totals where it stays rain for most of the day. This afternoon and evening the cold air will rush in very quickly. This will result in a flash freeze and things will get very icy very quickly. Temperatures late tonight will be in the single digits and some areas below zero by tomorrow morning. Factor in wind gusts that will be whipping over 30 mph, that will put wind chill values down into the -10 to -20. It will brutally cold and dangerous through Sunday with temperatures that won’t even climb out of the teens. Click here to see an hour-by-hour look at the winter storm. You can view his latest forecast here . Indiana State Police Sgt. John Perrine and Wayne Township Fire Department Captain Michael Pruitt joined us in studio this morning to talk about ways to stay safe during the winter weather. Good morning! Parts of Central Indiana are waking up to rain but several counties are under a winter storm advisory as the chance of snow and ice are still in the forecast. You can view the latest forecast here.